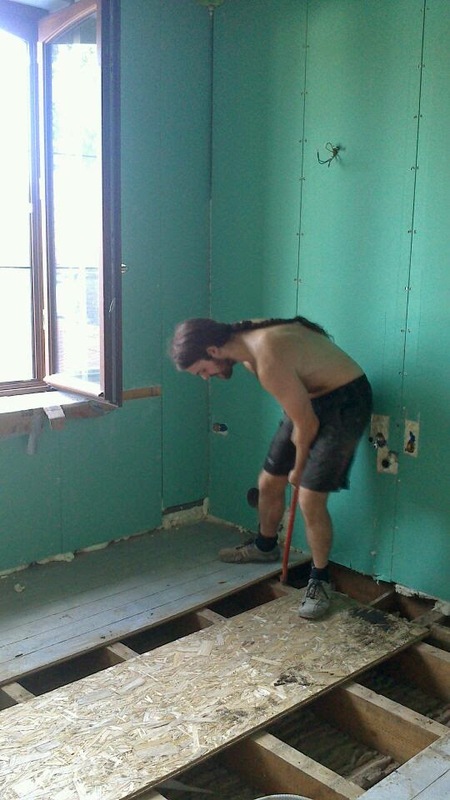 The bathroom is going to be placed in the smallest bedroom, which is still quite large for bathroom standards (about 12 m²), but it was the only reasonable option in order to have a bathroom close to the bedrooms. This room is on the 1st floor of the house so it doesn't have a concrete base, only the ground level floor has. The room's floor is supported with wooden beams of about 14 cm x 6 cm, placed about 40 cm apart. Though the wood is still in good condition, it makes the floor all in all quite 'elastic', which puts some constraints on what kind of floor you can lay. The basic options are wood (solid wood, not laminate, since it's still a bathroom) and tiles. Putting a tiled floor is not advisable because tiles are not flexible and although thinset has some elasticity to it, it won't be enough to bend as much as the floor underneath would. We then considered putting a wooden floor and treating it with a decent water-repellent oil, but we also wanted to have an open walk-in shower so it's quite difficult to estimate how the wood will react over the years with all the humidity. We are concerned with durability and don't want to start renovating everything all over again in 10 years, so tiles were back in the picture. This also means that the floor structure underneath will need to be made much more rigid, but hey, sometimes you gotta roll the hard six. This will actually be the first time since I graduated that I will ever put one of my engineering subjects to practical use. The problem with the wooden floor is not the strength - it is probably still strong enough to carry an elephant - the problem is that it bends too much while carrying weight, as opposed to concrete which hardly bends at all and is therefore much better to put a tiled floor on. Looking up what modern building standards say about how much a floor should bend I found out that the floor is at least a factor 4 too elastic. Although you would think that the beams look quite big and 40 cm apart is not too much, a little bit of introduction into the physics of it will explain better what the problem is. To understand what makes beams carry load, you need to understand that next to size and material, the shape of the cross-section is important, it determines something called the "second moment of area". The second moment of area is a useful concept because it is only determined by the cross-section of a beam, so once you have calculated this, you can apply it to any beam of any length and any material. The beams have a rectangular shape and are 14cm high and 6 cm wide, as stated above. A quick look at this list teaches us that for this shape the second moment of area is width x height³ / 3. This means that when the width increases 2x, the strength of the beam increases 2x. However if the height increases 2x, the strength increases 8x (= 2³). The beams in our floor are not very high compared to modern standards, which would rather use narrower and taller beams. (e.g. 3 cm x 26 cm) and put them closer together. Just increasing the height from 14 cm to 26 cm would already make the floor 6.4x more rigid. So the problem is identified, we need to be able to take some measures to increase the rigidity. 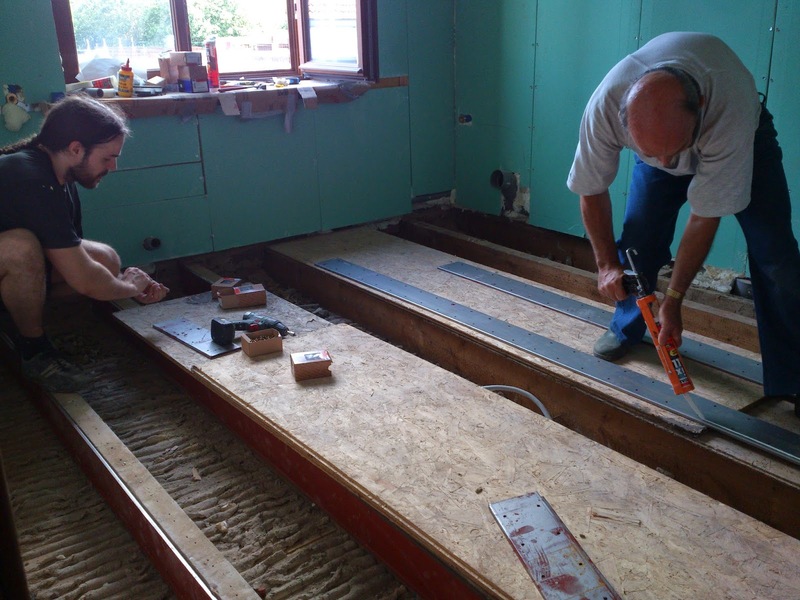 Using wood again was our first choice, but proved to be quite challenging, as there are only 2 options: Either raising the floor 10 cm and use taller beams, or put 4x more beams . The first would be unacceptable because the room would need a step just to get in, the second would be a ridiculous waste of material. A beam of 6 cm every 10 cm would mean that the floor would be more than 50% beam. Another option would be to put a concrete floor with lewis dovetail sheeting. Although this system allows for using little concrete to get a strong floor, it is still a big and heavy slab of concrete adding to the load of the aging beams. No, the problem is that the beams are not strong enough and pouring concrete over it will make the surface more rigid, but weaken the beams. There is another material though that has a much better weight to strength ratio than concrete: steel. I wouldn't have thought of it first but I got the idea from a colleague who had a similar problem and who's friend, an architect, proposed to use this approach for old wooden floors (and took it to another level). If it can keep the empire state building up, it can surely keep our bathroom floor up. To know why steel is doing better than wood, you need another factor for calculating the strength of a beam: the elastic modulus. It is dependent only on the material being used and relates directly to the strength of the beam. A quick look at the list here shows that construction steel, with a modulus of 200, is about 22 times better than wood (pine along the grain), with a modulus of about 9. Wood is also a natural material which makes it quite unpredictable, so you might have some very good and very bad pieces. This translates quite simply to the fact that steel would give the same strength with 22x less material, so the cross section of the beams (if they would be steel) could be 22x less. If you look at steel beams used for construction, their cross-section is always I-shaped. The reason is quite simple: the further away from the 'center of bending' the material is, the more it contributes to the strength of the beam (it's the same as the leverage you get using a crowbar or pliers). So to save material (and therefore useless weight), the beam is made wide far away from the center and thin close to the center. The idea is to mimic this behaviour and create I-shaped beams out of the old wooden beams by attaching steel C profiles (in fact half an I-profile, cut vertically) on each side of the beam. Without making too many calculations in detail, the following should be true: the elastic modulus of the material multiplied with the second moment of area determines the strength of the floor (since the only other factor is the length of the beam, which is not free to choose). The result of this multiplication for the wood, currently, is 4x lower than the what we want. Using an online calculator for calculating the second moment of area for I-profiles I found out that the C-profiles in steel should be 13 cm high and 2 mm thick, with the top folded out for 1cm, as shown in the drawing below. These shapes can be cut and folded out of sheet steel and are therefore quite cheap and easy to produce, with holes pre-drilled in them every 10 cm to be able to screw them to the wooden beams. 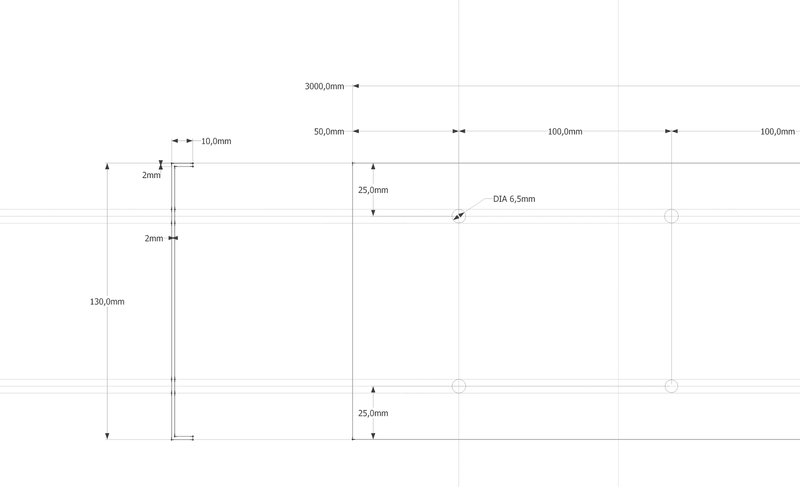 The picture above is the technical drawing I used to have them made to measure. The second moment of area of this shape is about 12x smaller than that of the original beams, but then again steel's elasticity is 22x less. This means that the steel in itself, despite being just 2 mm thick (compared to 60 mm for the wood) is actually nearly 2x as strong as the wood. Together they will make the beam structure almost 3x as strong as it used to be. Still not the 4x factor we wanted, but we will achieve that with the top layer of floorboards which will also be thicker as it used to be. The original floorboards were just plain independent planks of about 18 mm thick and 10 cm wide. The problem with this is that one plank is carrying your entire weight if you step onto it, the others are not contributing anything to the rigidity. It's not so weak that you'll fall through, but it's still too elastic to tile upon. For the surface I therefore opted to put 3 layers of boards in perpendicular orientation. 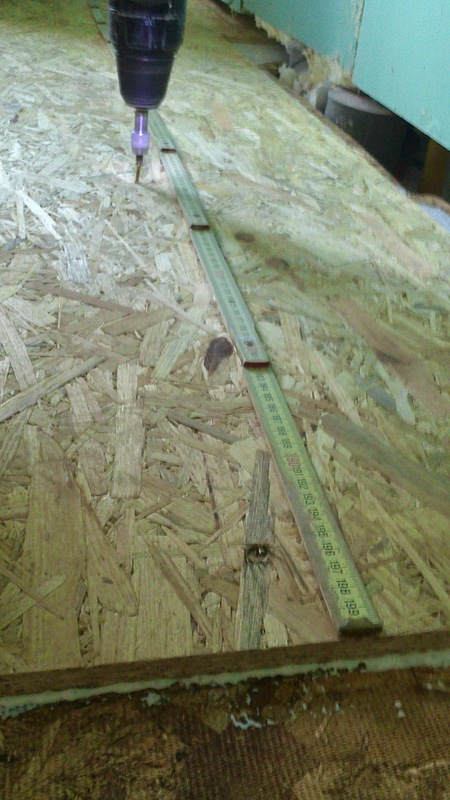 The bottom two layers are OSB boards of 12 mm, the top layer is plywood of 8 mm. The reason why the top layer is plywood is because we need to bridge a gap of 8 mm and OSB doesn't come in any arbitrary thickness. The reason for the gap is that we're using tiles of a different thickness for a decorative mat pattern For these we make a small cutout in the top layer. OSB and plywood are similar in strength but OSB tends to be cheaper. Anyway, the result is a floor that is 32 mm thick, all layers glued and screwed solidly to each other. This configuration is much more solid (I don't have any calculations ready here) than the original floorboards because it acts like a single, solid piece of material. 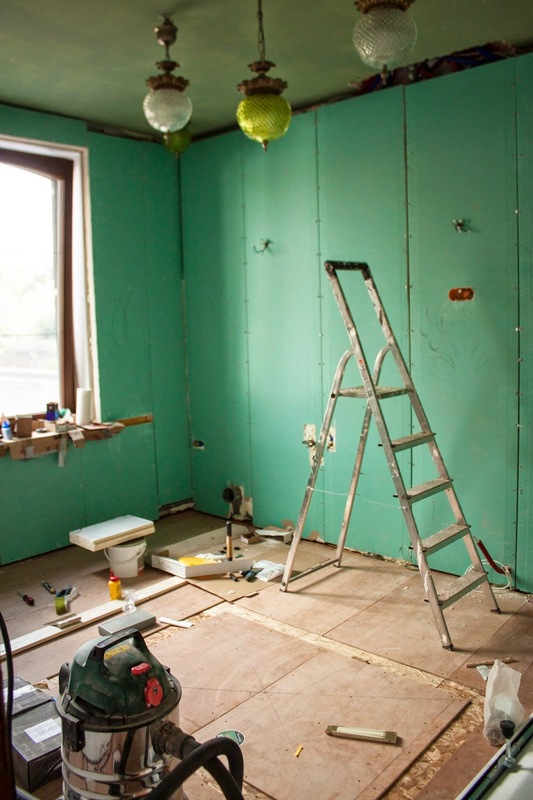 Putting pressure on a single point (e.g your foot, or the leg of a bath tub) will cause a lot less bending this way than with the old floorboards. So far for the boring (or exciting, if you want) theoretical part. Up next is putting it all together. It starts with taking the old floorboards out and clearing all the wooden beams of any nails or other stuff sticking out so the steel plates can be tightly attached, trying not to fall through the plaster ceiling below. We decided to treat the plates against corrosion although it is already corrosion resistant (as it is steel), with a special oil-based paint. To do this, we first needed to wash off the oil that came with them (which is put on to ward off humidity and therefore corrosion). Drying in the sun after washing with detergent. 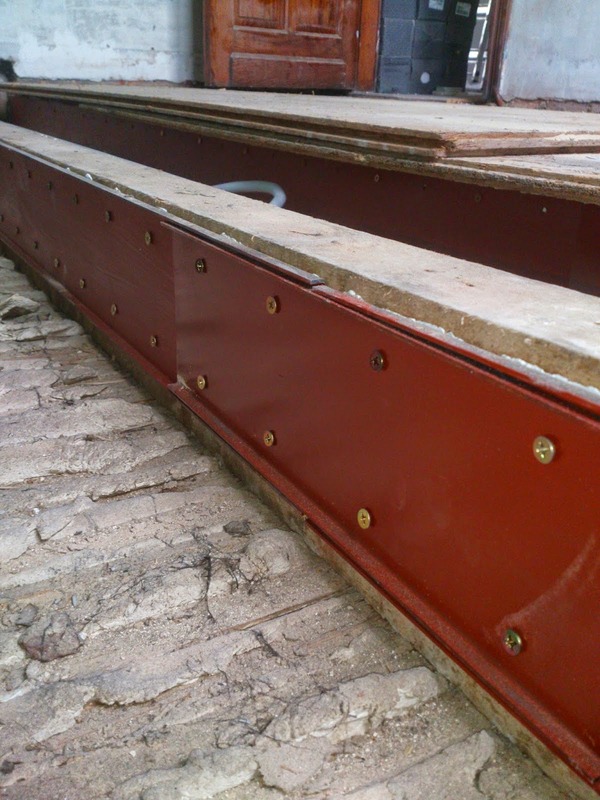 Since the steel plates are smaller than the original beams (13cm vs 14cm) it is not so difficult to fit them. A bigger size would have been even stronger but would also have been a pain to install, as the original beams are not clear on the bottom, due to the plaster ceiling of the room below. The white stuff you see between the wood and the steel is a universal glue we put in between to make sure that the different parts don't move at all relative to each other so that the combination of wood and steel acts as a single beam. I also opted for using a lot of small screws instead of fewer but larger bolts to spread the load more equally and to be able to get the steel fit more tightly to the wood. It's more work but the result should be better. Once all the beams are done, we move on to the surface. 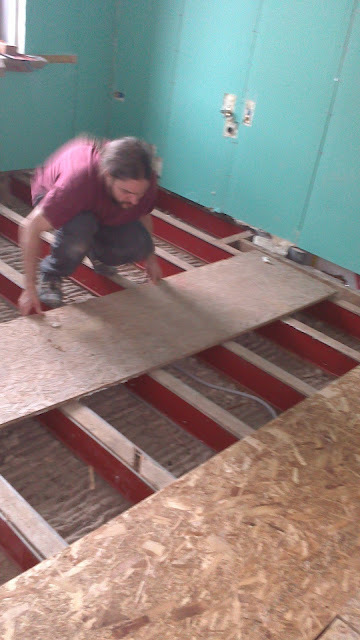 The first layer of OSB boards is put perpendicular to the beams and screwed well into them with long screws. This layer gets covered with wood glue over the full surface (using a notched trowel) before putting the second layer. This layer of OSB is also screwed with long screws into the same beams, as well as to the bottom layer (with short screws), mostly to clamp the two layers well to each other for the wood glue to act optimally. Second layer perpendicular to the first one, screwed and glued. As a third layer we used the 8mm thick plywood as shown below. This layer is laid the same way as the second: wood glue all over the board (as seen on the right of the picture below) and screwed together tightly with small screws, perpendicular to the previous layer. 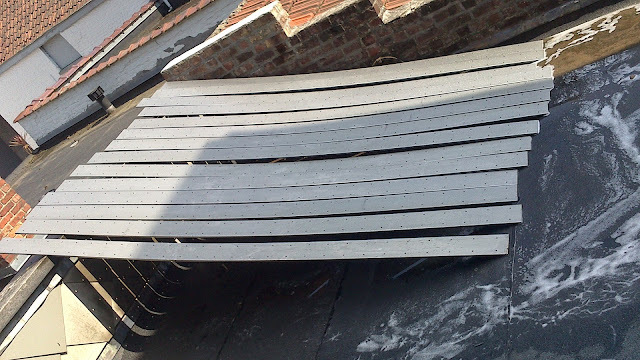 The result is a reinforced floor that acts like a solid piece of wood of 32 mm (as compared to the independent floor boards of 18mm that where there before), on top of steel-reinforced beams. 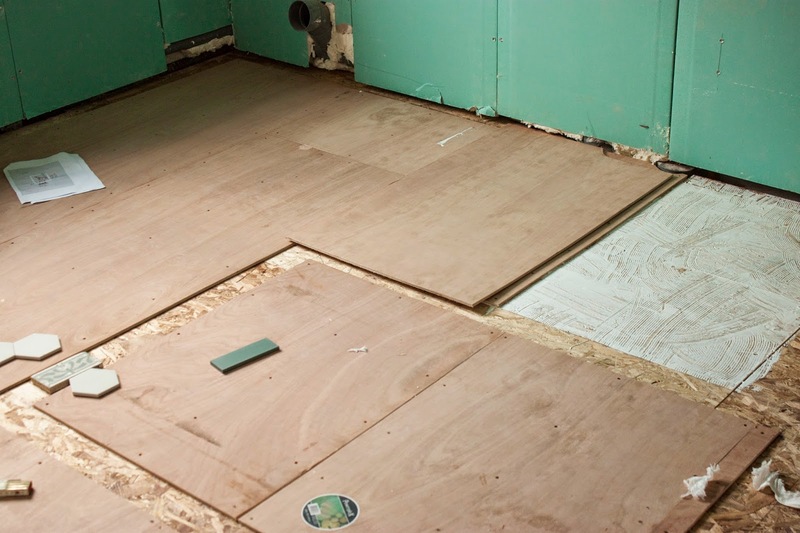 This floor is now ready to be tiled upon, which will be covered in another post.